Goat cheese cheesecake with grapefruit curd has been haunting my dreams! That one fateful pie delivery day when I received an awesome goat cheese cheesecake from fruit+flour changed it all. I crave it. I dream about it. And I can never look at cheesecake the same way. So since it is Monday and, naturally, muffins will be had, I decided to muffinize this cheesecake. 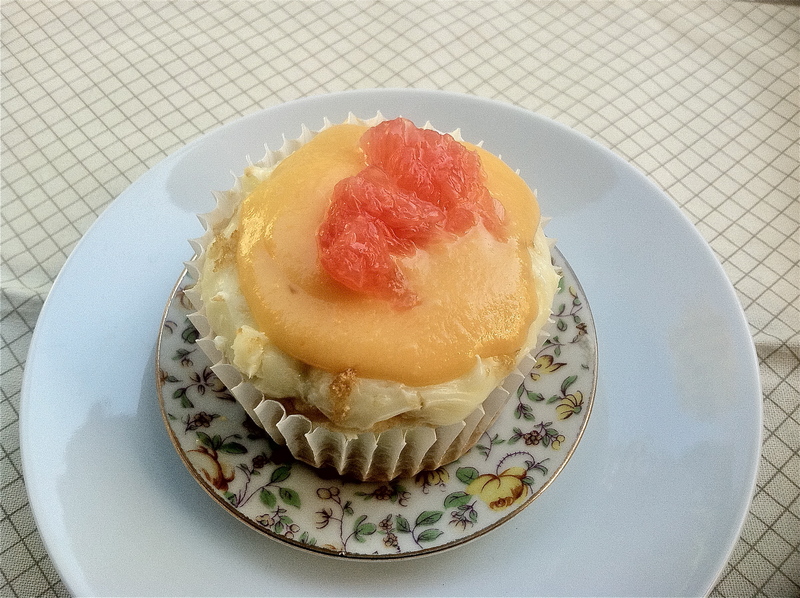 So here you have it: Goat Cheese Cheesecake Muffins with a Grapefruit Curd. Smell it. Savor it. Dream about it. It is creamy, delicious, citrusy and sweet. There is a wonderfully subtle tang from the goat cheese and a nice aromatic burst from the grapefruit. Best of all I came upon a glorious revelation while making these muffins – the basic ingredients for most muffins are pantry staples so when you need to satisfy a craving but are short on time or resources the obvious solution is to just muffinize it! So go forth and muffinize your week! 1. Preheat the oven to 350 degrees. Line a muffin tin with 12 paper cases. Sift the flour and baking powder into a large bowl, then stir in the sugar, grapefruit rind and salt. Beat the eggs, vanilla extract and milk together in a jug or bowl, then stir in the butter and gently mix into the dry ingredients to make a loose, slightly lumpy mixture. Do not overmix or the muffins will be tough. 2. Mix together the softened cheeses and sugar for the filling. Fill the muffins cups half way then top with a teaspoon of cream cheese. Fill more muffin mix until the muffin cup is 3/4 full then spoon a tablespoon of cream cheese over. 3. Bake for 15 minutes until well risen and golden on top. Remove from the tin and allow to cool completely on a wire rack. In a medium saucepan combine grapefruit juice, lemon juice, zest and sugar. Heat until barely simmering. In a separate bowl whisk together egg yolk. Pour half of the heated juice, zest and sugar into the bowl of yolks and whisk vigorously. Return this to the saucepan and continue to cook over low heat while whisking until mixture thickens and coats the back of a spoon. About 10 mintues. Remove from heat and stir in the butter 1 tablespoon at a time until all is combined. Let cool and set before serving. Hot Chocolate For the Best Valentine’s Day Ever! This looks perfect with all the winter citrus right now in season! Love it! Get out of town! You are such a tease. I am now fasting from all animal products so I can only dream. Can you do a vegan muffin recipe in the next 7 weeks for me, pleeeeasse? I am digging this grapefruit/goat cheese combo! Hmmm, what should I “muffinize”?! You had me at cheesecake. I think this sounds delicious!